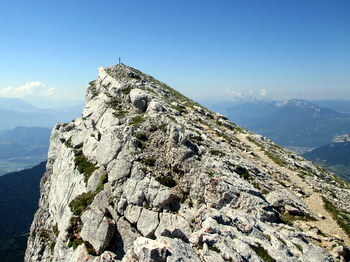 Chamechaude is the highest of the major hills of the area, and it dominates the valley of St. Pierre de Chartreuse. Its height is emphasized by its distinctively shaped peak, and its isolation from its neighbours. To the south it presents a fine rampart of cliffs. It does, however, suffer from being somewhat too accessible, with the col de Porte, the major route between the St. Pierre valley and Grenoble, reaching a height of 1326 m within 2 km of the summit (map). This has led to the creation of ski development with a piste creating an unsightly scar down the western slopes. However, there are far worse areas of ski exploitation, and the piste is avoided by the paths. Chamechaude is a beautiful mountain, with outstanding walking, a dramatic summit ridge, a wealth of flora, and is well worth a visit. Its name, according to Sombardier, is derived from "chaume", a traditional word for mountain pasture, and "chaude", indicating its sunny aspect. There are three routes described - these are really the main routes on the hill. The first two describe half-day walks up to the summit, which can be combined with a rest day or a visit to Grenoble; the third is an outstanding full-day walk that actually covers much of the same ascent and descent, but combines it with a spectacular tour of the mountain.